A lone drifter gunman rolls into a post gold rush Nevada mountain town, posed between two warring clans the Genji and Heike, who are searching for a legendary hidden treasure. The gunman, blessed with uncanny shooting skills, is asked by both opposing clans to help one side find the gold and a stake in the claim. With tensions rising, the guman must decide where his loyalties lie, leading up to a vicious and deadly gunfight for all of the wealth. Japanese creator of Ichi: The Killer and Audition, Takashi Miike brings a fresh and rousing nostalgic look at the spaghetti western genre in Sukiyaki Western Django. Thrilling and entertaining from beginning to end, Sukiyaki Western Django excels in its highly stylized gunplay and dramatic overtones in a cross-genre mash up of western and japanese cinema. Miike does a formidable job taking the grace and look of the japanese samurai and combining it with the rugged and abbrasive western setting. The vast western landscapes used with the contrasting Japanese architecture was particularly stunning, furthermore Miike's use of weather also created vibrant imagery on screen that will imprint into memory. The imagery and background used Quentin Tarantino's scenes are particularly dynamic and stimulate a vivid imagination of the southwest backdrop. The music throughout Sukiyaki Western Django is also outstanding, adding further enjoyment to Miike's ringing tribute to the western film genre. Takashi Miike's success in Sukiyaki Western Django is its graceful and stylized gunfights. Hopefully, you are not a realist and a bullet counter when it comes to spaghetti western, because very few times do the shooters take time to reload during gun play, but the result is an euphoric feeling that keeps the viewer entertained throughout. The actors also do their best wielding the guns and using them in a fashion that quickly reminds the viewer of a samurai. Miike does not stray away from blood or gore either, with splatter coming as fast as the bullets do. This violent accomplishment is masked with hilarious and whimsical takes on the ultra-violent nature to the film. Put together, Sukiyaki Western Django is a laugh inducing and shock producing shotgun blast that will keep you enthralled up through the climax. 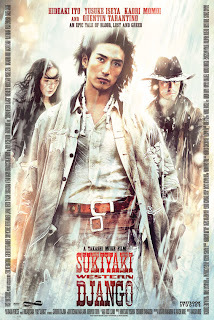 Sukiyaki Western Django's storytelling unfortunately, isn't nearly as impressive as its gunplay and stylized visuals. The story comes in a couple of different storyarc's that weigh down the film and can easily be confused with one another. There is the lone gunman's tale, a tale outlining the warring clans rivalry, tales of each of the opposing clan leaders, a love tale that could bring the two rivaling clans together, but instead causes a much deeper divide and there is also the tale of the gold that each opposing clan is looking for. All of these tales combine for a tiresome and complex storyline that feels unneeded for a film so heavy on gunplay, resulting in disappointment. A few of the storylines, do add depth to the violence and revenge often themed in the western genre, but overall it slows the story down too much with its various fragments that together are not cohesive in the slighest. The performances in Sukiyaki Western Django are both troublesome and invigorating in a unique way. While the performances are captivating, the western drawl dialogue utilized by the japanese actors becomes so fragmented, it takes away instead of paying homage to the genre. Miike does use some great lines from spaghetti westerns past like, "A man's gotta do what a man's gotta do" that resonate the mood, but with the heavy japanese accent, it pulls the viewer from their enjoyment. On the psoitive side, the actors brilliantly portray the western persona embedded with a rich japanese culture. Quentin Tarantino, the only American actor within Sukiyaki Western Django, does a flawless job as Ringo a mirror reflection of the Man with no name. Hideaki Ito is equally impressive as the lone gunman, delivering a perfect resemblence to a rugged traveler who gun skills are more than impressive. seen so many times in spaghetti westerns. Teruyuki Kagawa, as the dual identity Sheriff of the Nevada mountain town, delivers a laugh-filled performance which keeps you smiling all the way through his metaphor filled death. For fans of the spaghetti western genre, Sukiyaki Western Django is a blast. The film does not take it self to seriously, while still delivering a strong tribute to the genre. The films heavy gunplay and stylized violence play well in the genre and the japanese cast do their best to outshine the overloaded storytelling. Takashi Miike delivers a memorable western that is filled with hysterical violence, stunning cinematography and set design, a resonating score that all add to tantalizing experience that can be enjoyed time and time again.